In the ongoing saga in asking for safe, comfortable cycling on downtown's John Street, Trinity-Spadina MPP Han Dong cancelled a planned meeting with constituents, community representatives and cycling advocates on less than a day’s notice and didn't respond to correspondence from Trinity Spadina residents and voters for months. After discussing the issue of conducting another Environmental Assessment for John Street which was already conducted in 2014, neither the local city councillor, nor the City of Toronto Planning Department feel there is a need to conduct another Environmental Assessment. Therefore we have cancelled the Meeting with Han Dong. He has no intent to work against the local councillor and feels the previously conducted Environmental Assessment sufficiently addressed local conditions. If the local councillor or City of Toronto Planning staff wish to request an additional Environmental Assessment Han would be happy to discuss this. But until that time, there is no need to discuss the matter further with our office. southbound pedestrians numbered 4168, and northbound, 4459.
southbound pedestrians numbered 4634, and northbound 3215. David Stearn lost his original request in a letter from the Minister on November 30. But he has asked the minister to reconsider (pdf). I'm no lawyer, but it appeared that the Minister said that the Act doesn't allow him to reconsider this type of EA, and Stearn is arguing that he indeed does. The 2012 Assessment assumed that cyclists constituted 2% of the vehicles using John Street which was easily proven at that time to be completely incorrect, and likely fudged. The report even included a graph that was very suspicious where the bike traffic never wavered at any point of day. The City later posted a correction. It boggles the mind. John Street is the key link between the St. George/Beverly bike lanes and Richmond/Adelaide bike lanes, funnelling cyclists from the north and west into downtown Toronto. Revitalization is planned to expand pedestrian areas, but maintain two lanes of motor vehicle traffic, leaving no room for bicycles. We would likely see similar conditions to the top photo with cyclists stuck behind single passenger cars; prioritizing the few over the many. John provides a safe, direct crossing over the busy Queen Street. Whereas the City-chosen alternative of Peter provides a still-unplanned, unsafe crossing of Queen requiring cyclists to make an awkward jog over streetcar tracks. Go there in person and observe people on bikes, cars and foot trying to figure out who has the right of way in a constant, awkward dance. 4 downtown resident groups have voiced their support for bicycle lanes on John Street, York Quay Neighbourhood Association, the St Lawrence Neighbourhood Association, the Toronto Island Community Association and the Palmerston Area Residents Association. Sadly, the Minister of Environment has made no response nor decision on the residents' application made last February. And even sadder, City Councillor Joe Cressy, normally a steadfast ally of the cycling community, has refused to reconsider the design in light of the facts revealed by the Fall 2016 or 2011 traffic counts. The fate of the Bloor bike lanes hang in the balance with a vote at City Council later this month. For the over 6000 people now using it per day they may soon find themselves without any bike lanes—or some weird temporary bike lanes—if suburban politicians or a new business group gets their way. This new business group is bizarrely called the "Annex Business Bike Alliance". Or ABBA, but not nearly as fun as the band. They don't seem to be associated with the Annex BIA; rather they seem to have formed in protest to the Annex BIA working with the City on studying the Bloor bike lanes. They're concerned that the Bloor bike lanes in their current design are having a big negative impact on sales. But instead of getting rid of the bike lanes, they want to change the "design and operating hours". It's not clear how many Annex businesses decided to join this ad-hoc group. For all we know, this group might be just one guy, Barry Alper, who I presume is the same Barry Alper that is a co-owner of Fresh Restaurants. Yes, the same Fresh restaurant that gives a discount to Cycle Toronto members. The City of Toronto is conducting an economic impact survey that is being conducted by the Toronto Centre for Active Transportation and the University of Toronto. The report is coming out shortly in order to be ready for a vote at Council. ABBA, however, decided sight-unseen that it doesn't like the report and decided to conduct their own super scientific online "survey". Despite the fact that the City's survey was agreed upon by the merchants: "Korea Town BIA, the Bloor Annex BIA, and the Metcalf Foundation, in 2015, before data collection began and before the installation of the bike lane." 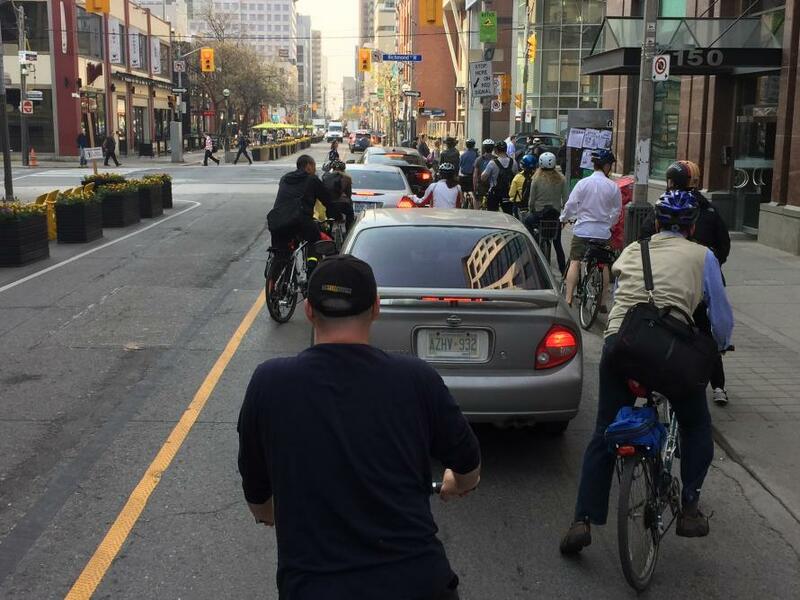 How has the Bloor Street Bike Lane Project affected my business sales? Hard to say, still limited sample. Last fall business was great. This has been an unusual year, there's been so much rain which really affects our business. I'd like to see how the bike lanes work over more time. And we can't ask the merchants to open their books. The Ontario Association of BIAs recommends against collecting retail sales data because of transparency and uniformity issues. TCAT states "the funding partners and the research team agreed that a survey question regarding sales without data to verify it would be insufficient." So the City's research also gathers "estimated customer counts from the merchant surveys, estimated spending and visit frequency from the visitor surveys, and business vacancy counts from a street level scan." But ABBA doesn't like that approach, saying it's coming "from a group whose opinion on economic impact from these lanes would not seek out the local business’s in a meaningful way". So ABBA crafted survey questions all on their own, and conducted the survey all on their own. Almost as if they wished to engineer an outcome that is favourable to their own preconceived notions of the prime importance of their motoring customers. As one of the merchants asked in their response: "Just curious about the purpose this survey? It's says it's an Economic Impact Study but of the nine questions 4 are about parking." I have exactly the same question. We know nothing about ABBA's survey except what we can see from Surveymonkey results. We already know the questions themselves are leading, but what about the parts we can't see and which ABBA failed to tell us about? Are the responses all from actual owners of the stores, or from random employees? Did ABBA coach the responders in any way? We don't even know for sure that ABBA didn't just add a few more data points themselves to buttress their argument. There is some suspicious activity in the responses. Out of the 63 responses, only 38 come from distinct IP addresses. And there are two time periods, June 29 and July 13 when there are quick successions of responses within 1-2 minutes of each other from the same IP address. It's almost as if someone filled out the survey multiple times themselves in one sitting. The City really can't take this survey seriously. We have never depended on street parking. There's only 2 space in front of our business and it's a total lottery for our customer to get one. There's a giant freakin' Green P in the Annex that was rarely full is still rarely full. Our customers that drive seem to be able to find it. The changes in parking have been insignificant. 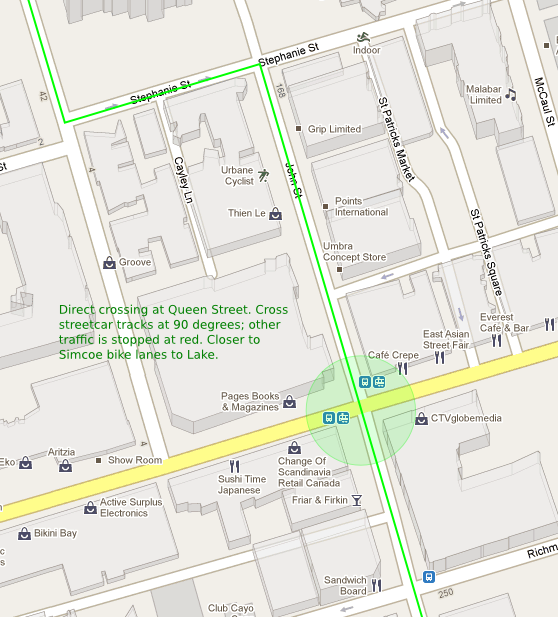 "How important is street parking on Bloor Street to my business?" Zero, not at all. I wanted to set-up business in a neighbourhood close to the subway, walkable and accessible by bike. That's why we came to the Annex. If we wanted parking we'd by out in Mississauga Dundas W and Erin Mills or something like that. We are the Annex Business Bike Alliance who want to encourage and expand cycling in the GTA but do it in a way that does not dramatically impact local independent business’s along Toronto’s main streets. The Bloor and Bike lanes design and operating hours have created a highway that has reduced business activity along the entire strip (Madison to Shaw). Traffic to the area to shop has been reduced as cars do not come and cyclists do not stop and shop. Where have I heard "bicycle highway" before? Oh yeah, former Councillor Adam Vaughan referring to the Richmond/Adelaide cycle tracks. This seems to be the go-to criticism now; make it seem cars are just soft pillows on wheels meandering at a walking pace and bicycles are monsters ready to eat your children. Someone didn't give this kid the memo. How is this supposed to work for kids biking to school? Do all children live west of their schools? They clearly have not given school kids any thought. May to September?! One of the merchants had even suggested only open the bike lane during the summer months: June to August. What about people who like to bike in all the other months without snow: March, April, October, November? It's already October and I don't see a hint of snow nor a drop in the number of people biking. But even with snow the City has been plowing the Bloor bike lanes so there's less reason to stop biking. I find it amazing that Canadians think nothing of sending their kids out to play in the snow but can't imagine biking in cold weather. I've got a better idea. As a pilot project let's remove all car parking on Bloor and let's see if that makes as much of a difference as you assume. Good luck fighting local residents on this proposal. Sure go ahead. Make sure cyclists don't go over the 50 km per hour speed limit. This actually sounds like a good idea. I'll take a basket. But you know, it's already a lot easier to stop and shop on Bloor while biking rather than drive and park. Maybe instead you should try to entice with baskets all those car drivers who lost years ago to Costco or Walmart.